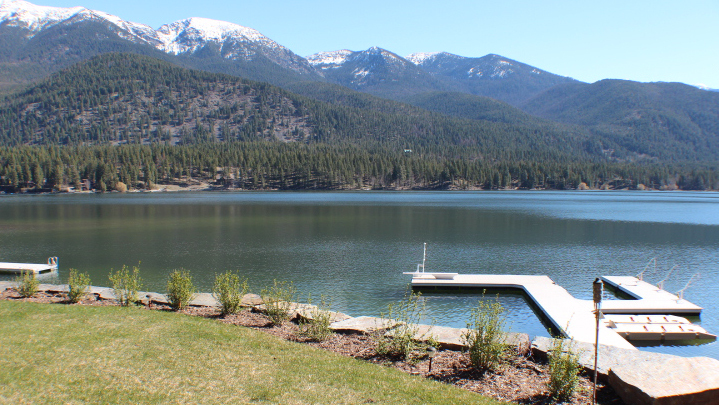 Lake Blaine is one of the closest lakes to the commercial center of the Flathead Valley (Kalispell) and to Hwy 2, so it has many full time residents, along with a large contingency of Canadian and vacation home owners. It is nestled at the foot of the Swan Mountain Range with the south and west shores boasting of excellent mountain views. Lake Blaine sits at an elevation of 2,997 feet and is located within a ten minutes drive east of Kalispell. The lake is about 382 acres in surface area with an average depth of 51 feet and a maximum depth of 141 feet. Lake Blaine is a fun lake to hop on your skies for an afternoon tour around the lake. You’ve got to live on this lake to boat on it (or have a good friend) because there is no longer any established public access on this lake. The real estate along the shoreline of Lake Blaine is dotted with cabins and upscale homes and would be considered fully developed. There is generally only a handful of homes or property for sale at any one time and many times none at all. Recreational boating includes water skiing and quiet canoeing. Check back frequently as new homes come up year round.